But the light can be very magical during the dark season too. Just like in this photo where suddenly the sky turned red. The same mountain can be seen in this picture. That is gorgeous! You should schedule tours up there right before the sun returns so people can come experience it. Wow,beautiful light, sky and landscape, it wonderful to hear about the way life is further up north and that you are looking forward to the sun coming back. 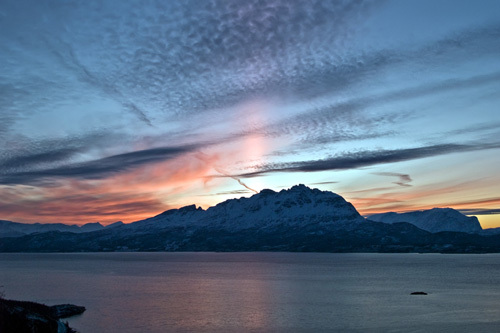 Id love to shoot some photos in Norway it looks like a fantastically beautiful place to live. Like your pictures, very nice! Thomas you are surrounded by truly magical scenery. I envy you in that. However, you can keep the cold. Wonderful landscape with great clouds! You have a great site. Love this photo! Gives you a calm and relax feeling! I’ll bet you can’t wait for those 8 days to pass. But in the meantime, you are definitely capturing the magic of the dark season. Thank you sharing much for sharing that magic. That’s beautiful. I guess the “sunrise” and “sunset” are pretty much at mid-day this time of year up there? Oh my … having to wait for the sun to return… no wonder my best friend here from Norway lives to lay out in the sun. Very enchanting picture! You’ve done a great job. Btw, your entrecard is showing in my widget. Thanks for advertising on my blog. Welcome back to the land of the enlightened! Wow! It’s gorgeous! I love it! Another amazing shot, thanks for sharing! That is very cool. I used to work for a Denmark company. The main VP was from Norway. He was a very smart guy and loved to drink. I could never keep up with him. I need to visit your blog more. Better yet, I should plan to visit Norway itself. You should consider yourself privilaged to live there! That’s a lot prettier than winters around here. A lot colder, too, I imagine. What a beautiful picture of red light – really shows the beauty of the landscape. Do you call them mackerel skies? good one 🙂 great expousure and contrast. I don’t know still what is more surprising to me, the beauty of the northern sunset you capture through the lens or the fact that all your photos startle me out of this synthetic urban life and keep my attention 🙂 Divno! .ink.